Stella rocks this wonderful find from my recent trip. Can’t wait to wear it over a long black skirt or with black cigarette pants! 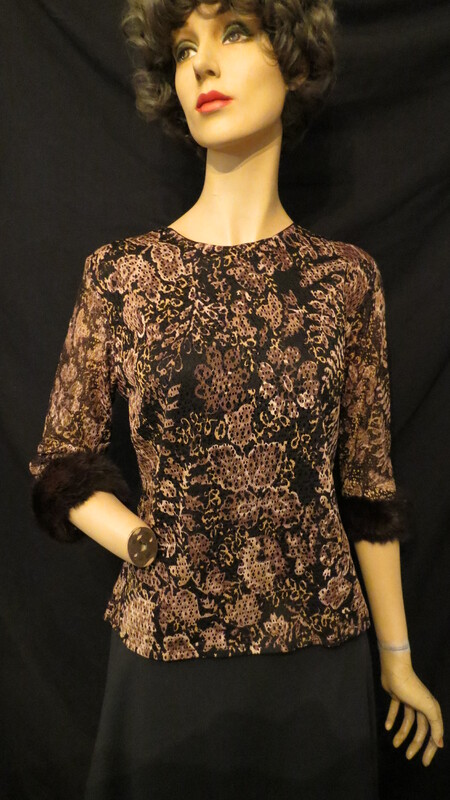 This was not a high-end item, in spite of the mink trim – like so many lovely things from mid-century, the average woman was able to buy and wear it. It is open-weave in a glossy synthetic material, lined with black fabric. The floral fantasy pattern reflects the colors of most, if not all, of the treasures I found in that country. Stay tuned to see more . . . . . It was made by a New Zealand clothing company back in the day. I was told by other vintage experts there that New Zealand used to have a very excellent clothing industry which has, sadly, gone now. But, so much more FUN for a modern sleuth . . . . .